The Yacht Seraphim: Yachts, Trains and Ocean going liners. Yachts, Trains and Ocean going liners. 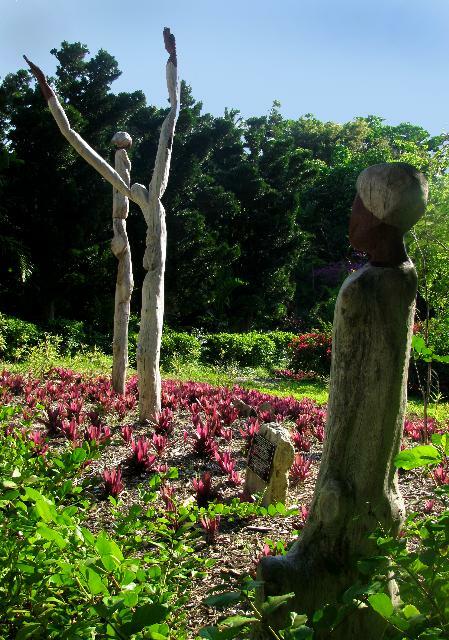 The Garden of the Groves in Grand Bahama is a beautiful and tranquil garden with waterfalls, peaceful glades and a labyrinth. It is a magical place with a super playground and an excellent café run by Julie and Yvonne with chef Stephan, where the boys gave me American Mothering Sunday lunch. My card was made from fresh flowers. It is also a good place for reflecting on big decisions. After chewing, debating and vacillating we have decided to ship, yes ship Seraphim to Southampton and explore homeland horizons. It was a hard decision which we have ground on for months. With hurricane season fast approaching the decision was pushed and shoved. South is out of the question. Chavez‘s Venezuela is no longer safe. Piracy has become a serious problem in the Rea Sea and Indian Ocean which blocks our way home if we go via the Pacific. Even before these dangerous waters we feel the boys are too young for the long hauls of the Pacific. So, we were faced with heading north and then back south, along the US Eastern seaboard for the third time. This did not appeal. 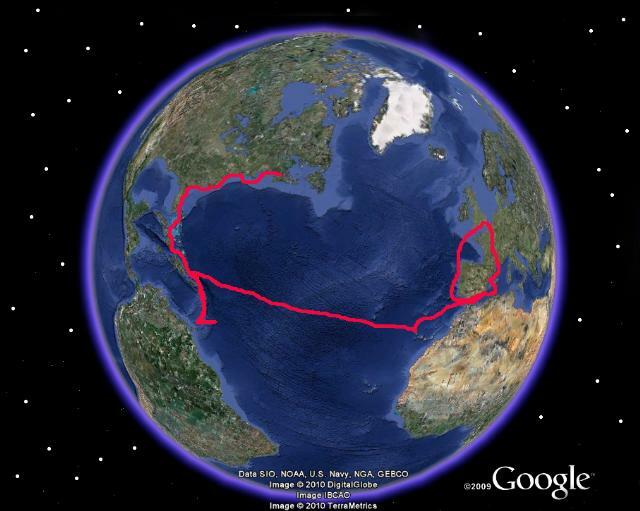 Since Palma in November 2008 we have sailed 4,700 miles and kept watch for eighteen months, 24/7, over two hyper boys under five. 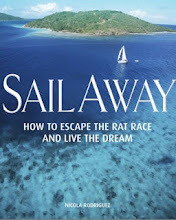 Cruising unexplored home waters will give us a much needed break before completing our circumnavigation when the boys are 9 and 7. From July 2002 to June 2010 with two years off for babies, we have covered over 24,000 miles in total from the Hamble in the UK, down the western coast of Europe, across the Atlantic, north through the Caribbean and the Bahamas to the Chesapeake in the USA and back to Grenada. We, then the Moonshiners, survived two hurricanes. Sadly Moonshine only made it through one and she was lost in 2004. In July 05 we set off on Seraphim through the French Canals with eight month old baby Jack. After three years in Spain and another baby, we returned to the Caribbean in November 08 where we voyaged from Martinique to Barbados, up the Caribbean chain to Florida then north to New York City and Long Island Sound, with a 100 mile side trip up the Hudson River, escaping Hurricane Bill, and back south via Fort Lauderdale to the Bahamas. It has been an extraordinary, improbable and priceless experience of which we are very proud. The last few weeks have been a time of stress and change but it is a time of new opportunities and new dreams to fulfil. Seraphim will be shipped from West Palm Beach to Southampton, where she will be berthed in Ocean Village opposite the berth from which we left on 7th July 05 for France. In July this year we shall start a Home Coming tour of the marinas of the south of England. Arrive Inspired Not Dog Tired…. And if all this news has not been exciting enough? We’re catching the Amtrak Silver Meteor overnight train from Florida to New York. Followed by two nights in a secret gem, the Wall Street Inn, a new and enchanting hotel near the South Street Seaport in Manhattan. And then … what next? We are Sailing to our home port Southampton in a starboard cabin on the Queen Mary 2. We’re bubbling over with excitement. Flying Virgin from Miami to London was the same price as a cabin on the QM2. No brainer which way to go. 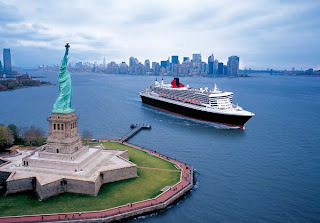 We set sail on 7th June from New York and arrive in Southampton 7 days later. Our last western Atlantic offshore voyage on Seraphim, for now, was from Grand Bahama to the USA. Seraphim slipped through a narrow weather window for a twelve hour crossing of the Gulf Stream back to West Palm Beach. En route John caught a huge Mahi Mahi, the size of Jack, who was keen to land him and eat him. John and I did not have the heart or stomach to kill such a magnificent creature. Reeling it in had been a Hemmingway-esque struggle, let alone landing it. Jack and James were deeply disappointed and “upset” that their “sushi” was released. The first time we saw America on the horizon in May 03 in Moonshine we were victorious, we had discovered the New World. This time it was a bitter sweet moment full of memories and hopes for the future. You are amazing for what you have achieved especially when you had 2 young boys on board. Not many could have done what you both have done- the patience ( I have seen you hauling groceries, laundry in less than ideal circumstances), your stamina, bravery, adventurous spirit.....We look forward to seeing you in England and then welcoming you back one day to America. You visit was one of our most wonderful memories of summer 2009. Love from Elaine and the "horrid" doctor!